In this article, you will learn about how to enter your payment details. Log into your Prolific Works account. Click on "Settings" in the Secondary Navbar. If you already have a plan, below you will see information about your current subscription. Click on "Set Up Payment Details." You will be informed how much you owe and when you will be charged. If you'd like to enter a coupon code, please do so now. Then click on "Validate." 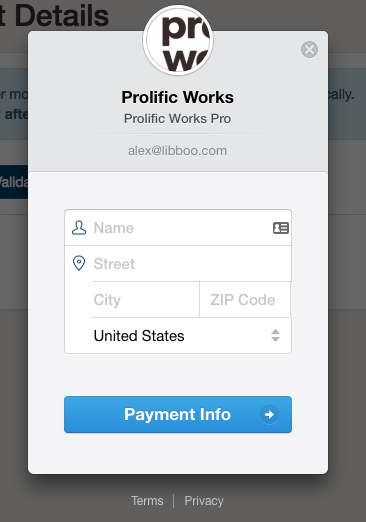 Click on "Add Payment Details." A window will appear with information for you to fill out. When you are done, click on "Submit Details.